and All New Seamless Gutter Installation! For all of your Charlotte, North Carolina pressure washing and painting needs, call the professionals at Excel Pro Service LLC. We specialize in a variety of residential and commercial property maintenance services, including: pressure washing, interior and exterior painting, staining, gutter installation and gutter cleaning, roof cleaning, and more. Call today for a quick quote and a fair price: (704) 251-7747. "I have always loved property maintenance. I like keeping up with my own home projects to keep the inside and the outside of my Huntersville home in good shape. I believe that maintenance is the best way to keep everything in good working order. When the outside of your home looks its best, you know your home has great curb appeal. When the inside of your home is well taken care of, you look forward to coming home at the end of the day. I love interacting with customers and seeing a finished product. I take pride in the work that my company does. If my name is attached to it, I am going to stand behind it. Which means it will be the best it can be!" Get rid of the grime, mildew, and dirt. Area Charlotte power washing services for residences includes cleaning decks, fences, home exteriors, roofs, driveways, walkways and patios. Power washing is a cost effective way to revive buildings, decks, drives and patios. Our Charlotte area Pressure washing crew also provides commercial power washing services for local businesses. We'll keep your building's exterior, walkways and parking garages looking clean and welcoming year round. Excel Pro Service LLC also provides fleet washing in the Charlotte area. For all of your residential or commercial pressure washing needs, call (704) 251-7747. Gutters that are clogged with leaves prevent proper water runoff. Which means you have the potential for water damage. Excel Pro Service LLC will ensure your gutters are in working order all year round with regular maintenance. Call (704) 251-7747 for a free quote on all of your Metro Charlotte gutter needs, including gutter installation, gutter guards, gutter cleaning and repairs. Let our team of professionals help you protect your biggest investment. If you've got black streaks or other stains on your roof, chances are you've got mildew. Algae feeds off limestone, commonly found in roof shingles. Don't let your roof become a breeding ground for moss, fungus, or mold. 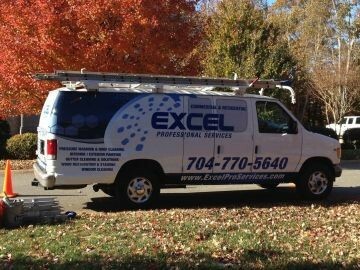 Call Excel Pro Service LLC for professional roof cleaning services: (704) 251-7747. Periodic roof cleaning will help preserve the life of your roof, saving you money in the long run and keeping your home looking great. Excel Pro Service LLC has been cleaning Charlotte roofs since 2008. Call any time to discuss your Charlotte, NC property maintenance needs. 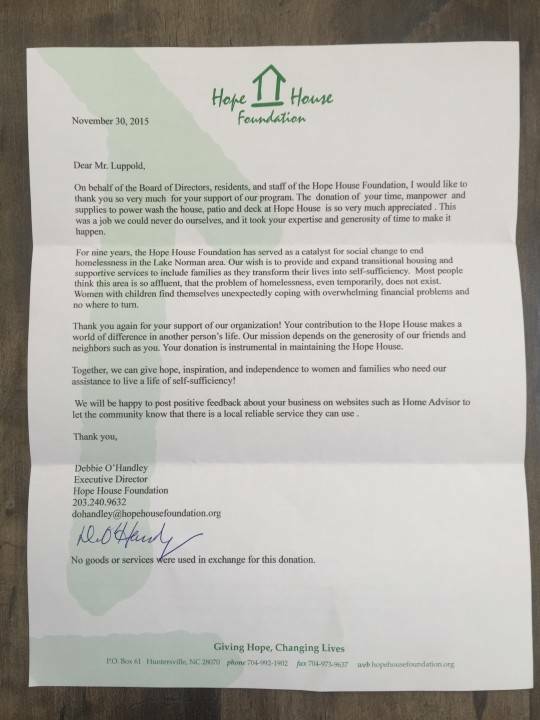 Excel Pro Service LLC proudly donates and volunteers services to the HOPE HOUSE in Huntersville NC.